Whether you are a personal trainer, an amateur performance coach, or a high-level strength and conditioning coach, you are in the same business: the business of improving people. People are not cars or computers that can be broken down and rebuilt the same way every single time. And although athletes may sometimes seem like machines, they are complex organisms with an incredibly broad array of thoughts, feelings and emotions. And ALL of them are unique in their own ways. As a coach, you have very little control over the state of mind a person walks into your gym with. Maybe they just failed an important exam, maybe their family dog just died, maybe their little sister just got accepted into college, or maybe they are in a brand-new relationship. Maybe they tell you and maybe they don’t. Either way, that person who is expecting you to help them improve their performance shows up. And he or she is going to show up in a different mood or a different physical and emotional state every time. You can help influence those states by creating habitual behaviors, but you will never have total control. However, you DO have total control over yourself and how you choose to handle each interaction. Why would you deal with every problem using the same approach? Often, the simplest and most effective answer is just outside the box of our normal thought processes. Now, don’t get me wrong. Good habits and consistency are paramount to success in any training program and you must lead by example as a coach. Don’t change your punctuality, don’t change your intensity, and don’t change what makes you YOU. But attempt to approach each situation with an open mind and realize that maybe the hardass strength coach barking and yelling isn’t always the most effective way to get someone to do something you want them to do. Below is a simple way to break down your clients’ and athletes’ personalities, your own self awareness, and how you can make adjustments in your approach in order to establish better connections, create buy-in, and build trust. The DISC system is a popular personality discovery system established in the 1920s by psychologist William Marston. Many successful businesses as well as elite special operations units use it as a tool when hiring new employees and high-performance soldiers to fit very exact and demanding positions. Personally, I use it as a way to gauge my athletes’ moods and change my approach to training sessions if necessary. The letters stand for Dominant, Influential, Steady, and Conscientious/Compliant. 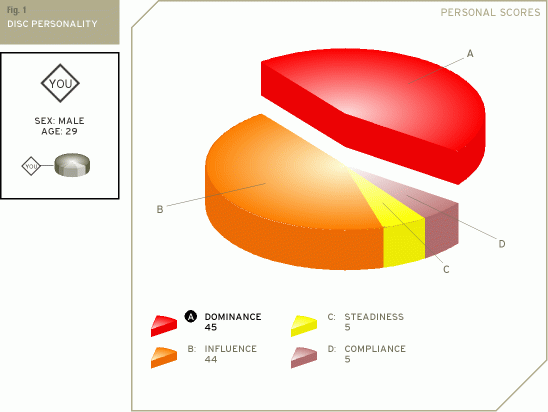 There are many DISC personality tests available online. One example is located here: https://www.123test.com/disc-personality-test/. I recommend taking the test to see where you fall within the four pillars and in order to gain a better understanding of yourself. Below is a simple table to help break down the four pillars of DISC. With a team or even as part of your client-intake process, a simple personality test can go a LONG way. It only takes five or ten minutes to complete, forces your clients and athletes to be introspective for a short time, and gives you a much better understanding of why they are participating in their sport or other exercise program. Even more importantly, it gives you, the strength coach, a window into how to properly motivate them and keep them focused. Here is a short list of DISC results and a few ideas I use when considering programming, individual workouts, and motivating factors for my athletes. Relatively High – Enjoy competition and challenge, goal-oriented, want to be recognized for their achievements and similarly challenged when they are under-performing. These are GREAT athletes to work with, but tend to overwork themselves at times and skip the ‘boring’ stuff like mobility and accessory work. Stress the small things and set up periodic challenges to maintain motivation over time. Relatively Low – Quiet and indirect in their approach, not risk-taking, cautious, and patient. It is much easier to tell when something is wrong with this type of person because they tend to be extremely consistent. Develop a progressive plan to push them out of their comfort zone, but take baby steps a little at a time in order to do it. Relatively High – Optimistic, skilled at meeting people, strong-willed and interested in meeting and being with people. If motivated correctly, these are your team captains and group leaders. Give them more and more responsibility whenever possible and keep them in a group setting. Relatively Low – Analytical, like to work alone, tend to take very little at face value. You must be very detailed and descriptive with these personality types. They will appreciate it much more if you explain the WHY in things and will often study what you tell them outside of the gym or training setting. Be careful with your word choice and remember that they probably still have good social skills, but only tend to use them when logic dictates. Otherwise, they prefer to analyze things within their own mind. Relatively High – Patient, kind, controlled, and usually willing to help others at the drop of a hat. I like to call people who score very high in this category my ‘grinders.’ These are the ones who consistently pick up the slack in the team setting and will be the first to volunteer to put equipment away, sweep and mop, and help explain things to struggling teammates. Ensure you recognize their contributions and TEACH THEM RIGHT! They will be the ones showing others how to move and perform when you’re not looking. Relatively Low – Enjoy change and variety, avoid routines for the most part. You have to stress the importance of forming good habits and sticking to a daily routine. The best way to do this is to vary the routine enough that it keeps them stimulated but consistent. An example of this would be in your nutrition programming; these types will not stick to eating chicken, rice, and broccoli three times a day so it will require a little more effort on your part to provide realistic options. Relatively High – Peaceful, adaptable, cautious, and ordered. They tend to stick to what has worked for them in the past and do not have problems sticking to the rules laid out for them. These people will appreciate structure and organization in their workouts and their programming and can help set the example with your athletes who struggle to follow stretching, foam-rolling, and mobility regimens laid out for them to do on their off days. Relatively Low – Independent, resent rules and regulations, appreciate freedom. These rebels can be your rule-breakers if you let them and if you do not motivate them properly. But, they prefer to be measured by results and are usually willing to try things that other people won’t. Put them first in line for new drills and exercises and avoid forcing them into pass/fail situations. Instead, measure their performance progressively and put as much individual responsibility as possible on them. Above is an example of what the results of one of these tests might look like. A simple personality test like this is an incredible way to evaluate and approach the way you and your athletes or clients interact with one another. Just five or ten minutes can give you a great window into what drives an individual’s performance and therefore give you a great idea of how to approach your programming and microcycles. Don’t be afraid to think outside the box; your efforts in perfecting your own leadership and motivation tactics will go a long way to improving the culture in your gym, weight room, or team.